Professor Hans van Lint of Delft integrated travel and traffic laboratory (DiTTlab) is involved in a new Horizon 2020 project My-TRAC that will receive 3,5 million euros funding from the H2020 programme Shift2Rail. The project aims to develop a novel transport services platform for the rail sector. In order to provide an improved passenger experience a smartphone app is developed by applying advanced behavioural and transport analytics and Artificial Intelligence algorithms to data gathered from diverse public transport and Open Data sources. 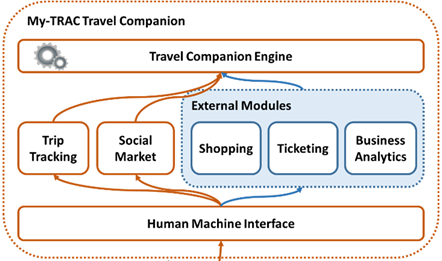 The My-TRAC application is a travel companion designed to operate similarly to a human companion; understanding traveller’s attributes and state-of-mind to derive conclusions from vague information as any human does. My-TRAC application will also provide predictive information concerning disruptions and disturbances. It will not only display data but analyse them through innovative algorithms to provide improved recommendations. The application implements a vast array of technologies, such as affective computing, Artificial Intelligence and user choice simulation, that fuse expertise from multiple fields. The researchers from TU Delft will focus on the analysis of travel data and the development of models using both Machine Learning (ML) and Artificial Intelligence (AI) technologies. My-TRAC will be the traveller’s gateway to various services related to using public transport, having rail in the epicentre. My-TRAC also involves public transport operators through the “operators’ interface” where they can retrieve and visualize aggregated data on users’ movements and state-of-mind that will assist in strategic and dynamic operations. Data that the operators retrieve are aggregated and anonymized while all models and algorithms are applied on the mobile device of the user, integrating the “privacy-by-design” concept. My-TRAC is working closely together with the Dutch national railways (NS) and the AMS institute, with the aim to develop a technology that will benefit both train travellers and operators in i.a. The Netherlands. The My-TRAC consortium consists of universities, public and private partners from Spain, Greece, Portugal, Belgium and the Netherlands. The work at TU Delft will be undertaken by members of DiTT lab and the new Smart Public Transport Lab at the Transport and Planning section. The involved researchers are Professor Hans van Lint, dr. Niels van Oort, dr. Viktoriya Degeler, dr. Simeon Calvert, dr. Oded Cats, ir. Leonie Heydenrijk and ir. Sanmay Shelat. The project started last September.